Gebzhalia is an antique dish from Samegrelo, western region of Georgia. 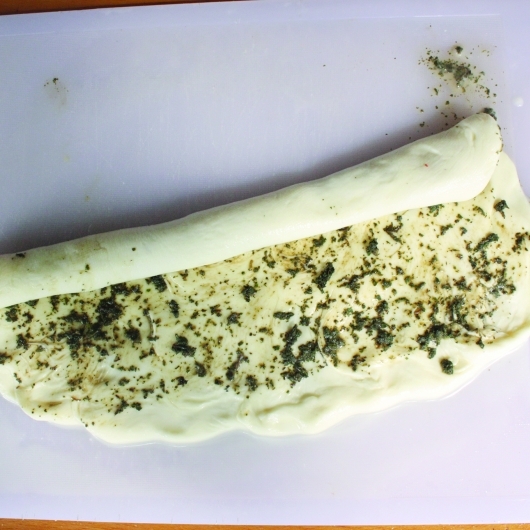 It is made from cheese, curd cheese and mint. Usually it is consumed with Ghomi, Georgian cornmeal. It has a well-defined flavor of mint which makes the dish unique. cooking Gebzhalia, otherwise you won’t get the desired result. For this dish it is best to use fresh, whole-milk cheese or Sulguni. 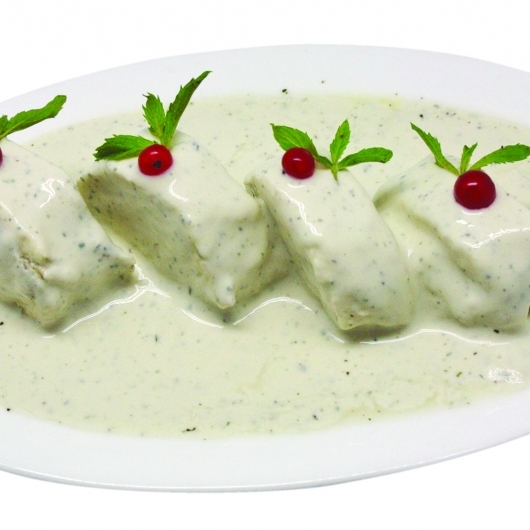 Prepare the ingredients: cheese, curd cheese, sour cream, milk, salt, pepper and mint. 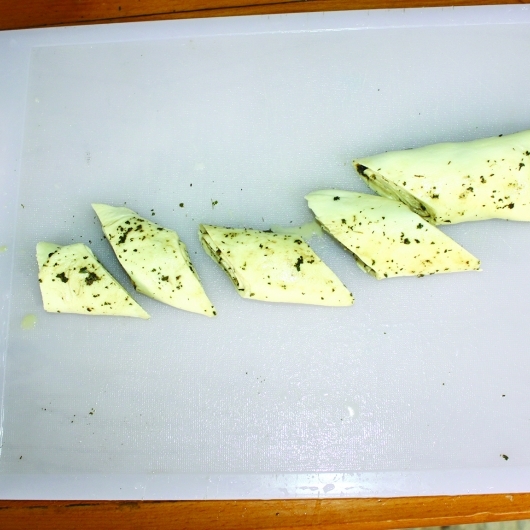 Cut the cheese into thin slices.Pound the mint. Mix mint, chopped pepper, salt and grind them. 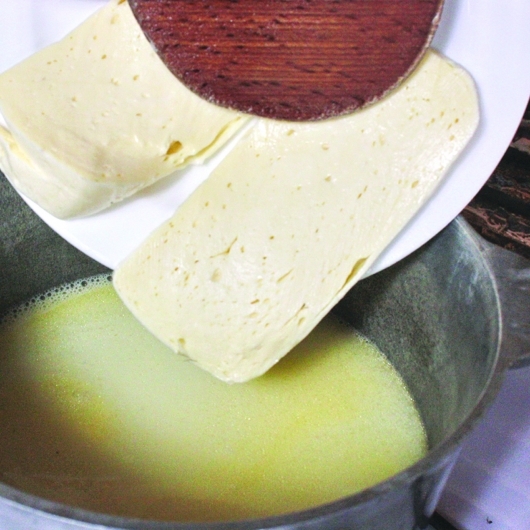 Heat the milk in saucepan (but don’t boil; otherwise the cheese will be overdone) and put cheese in it. Knead the cheese with wooden spoon until it becomes viscid. Make balls of the viscid cheese and remove from saucepan. Put it on wet kitchen board. Flatten the cheese mass fast before it cools down. Spread a thin layer of ground mint on flattened piece of cheese. Roll it and spread the mint on its top. Cut the roll in small pieces and set aside. Put curd cheese in a bowl. Add sour cream and a little cheese broth to the curd cheese. Stir and add cheese broth little-by-little until it gets sour cream consistency. Add to the mixed mass the remaining mint. 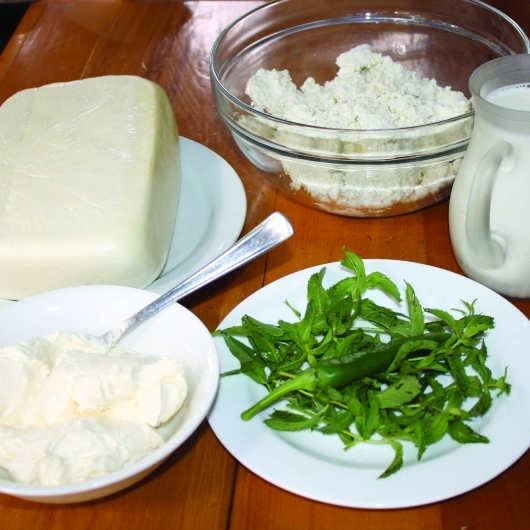 Blend the curd cheese and add the pieces of Gebzhalia.